Politicians have to take a lot of flack from a lot of different areas during any presidential election cycle. Shows from Saturday Night Live to The Daily Show get in plenty of jabs, and during this particular election season, Republican frontrunner Donald Trump has taken the brunt of those jabs in pop culture. Now, this week, Family Guy has gotten into the game, taking a shot at Donald Trump in its latest Emmy consideration ad. You can check it out, below. The for your consideration ads and mailers go out every year. 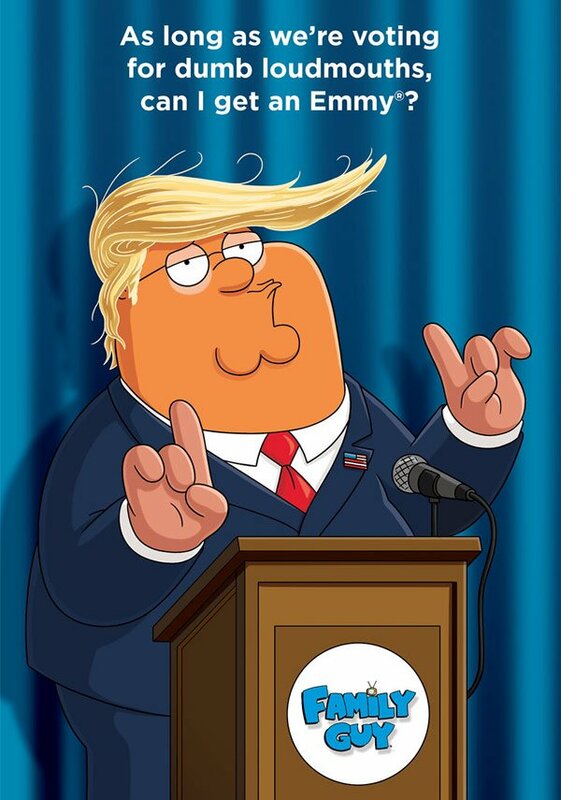 Although the Emmys don’t even air until the fall, it’s never too early to start campaigning, and this year Family Guy got a jump on some of the competition with a look at what Peter Griffin would look like if he morphed into the Trump-meister. There’s also a comment along with the poster, because it wouldn’t really make sense without a joke, slamming Donald Trump as "a loudmouth" and "dumb" (via THR). Family Guy has never shied away from controversy, even when it comes to Emmy ads. In the past, the show has taken shots at all manner of individuals and social groups. In 2012, the poster that went out famously implored the “bloated, overprivileged Brentwood Jews” to vote for the comedy. Newspapers at the time refused to print the ad version, but they were still sent to Emmy voters. Family Guy was an influential comedy on Fox for a time, but the Seth MacFarlane-led series hasn’t been nominated in the Outstanding Animated Program since 2006—although in 2009 it actually earned an Emmy nod for Outstanding Comedy Series, becoming the first animated comedy to be nominated in that category since The Flintstones. That was still a while ago, and it’s not a huge leap to see why Family Guy would go for shock value to try to gain notice for its newer ads. Hollywood has had a long history of using its influence to take sides in politics. But is this taking things to far? Or is it the right level of cheeky? No matter how we feel about the ad, it may not be super effective. As many times as Family Guy still gets it right these days, there’s so many great animated TV shows between streaming, cable and network TV that the competition is fierce. Plus, I’ve gotta say, South Park had one heck of a season this past year and the Comedy Central series hasn’t had to resort to brazen ads to earn the attention, either. We’ll let you know as soon as the Emmy nominations get announced. In the meantime, here’s what is coming to TV this summer.